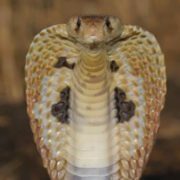 Like all reptiles cobras live alone, but Indian and king cobra make a rare exception to this rule. 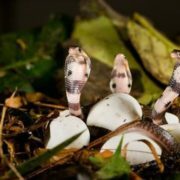 These snakes are the only reptiles that form stable pairs in mating season. 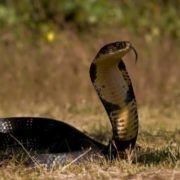 Some snakes don’t bite their victim, and … shoot it with poison. 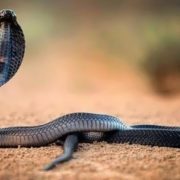 Indian spitting cobra is a sharpshooter. It can make a few shots (maximum of 28). 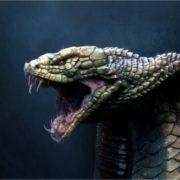 Snake can shoot at a distance of 2 m.
Despite the strong poison cobras have enemies. 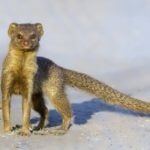 Larger snakes and lizards can attack young snakes, mongooses and meerkats hunt adult snakes. 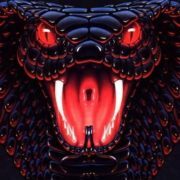 Cobras crawl well, climb the trees and swim. 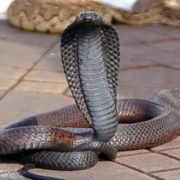 Most people think they are aggressive, but in fact these snakes are quite calm and even a little phlegmatic. 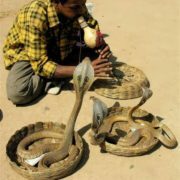 People are afraid of cobras and as a result often kill the snakes. 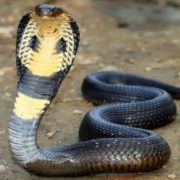 The king cobra of Asia is the world’s largest poisonous snake. 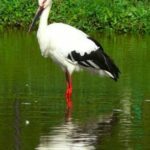 It can reach a length of about 5.5 meters. 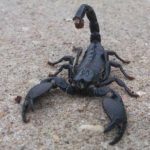 Its venom is so powerful that elephants have died within three hours of a bite. 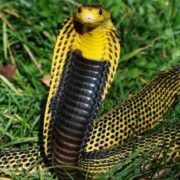 King cobras are yellow-olive to brownish black, sometimes with lighter bands across the back. 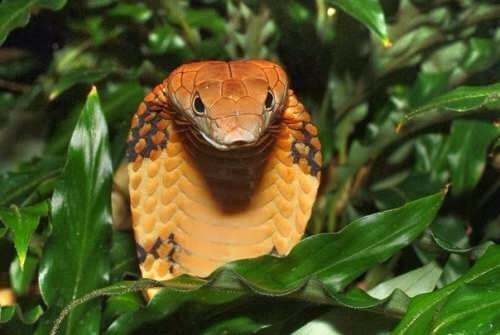 It may be the most intelligent of all snakes. 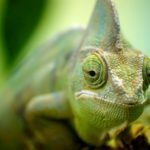 It mostly eats other snakes. 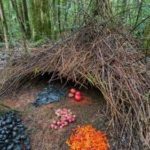 It builds a nest for its eggs and guards the eggs until they hatch. 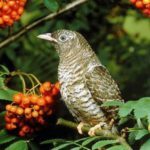 It lays 20 to 40 eggs. 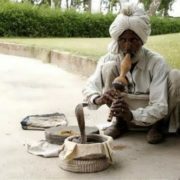 For a long time there was a kind of profession – snake charmer. 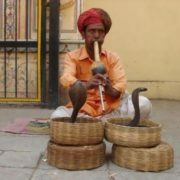 Cobras are in baskets or jars, charmer plays pipe and snakes go out and dance to the music. 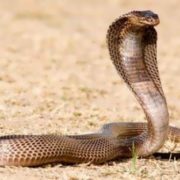 In fact, cobras, like all snakes are deaf, but they react to the dimensional swinging pipes. 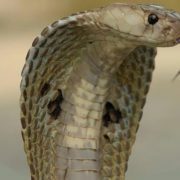 In India cobras often settled in the temples. They not only embodied the wisdom and were the object of worship, but also were guards. 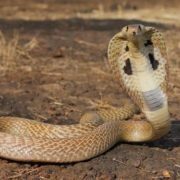 Cobra venom is a valuable raw material for the production of a number of medicines. 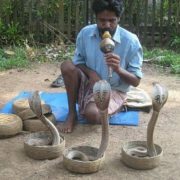 Nag Panchami is the day of the king cobra. 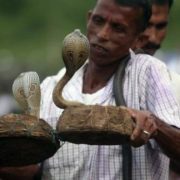 It is celebrated in India and Nepal, at least three thousand years in a row every year. 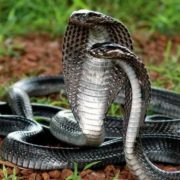 In different countries, cobra is considered a symbol of danger, power, wisdom, fertility, rebirth, meanness and mercy. 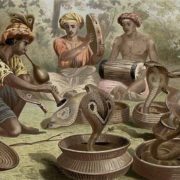 In many ancient cultures cobra considered a sacred animal. 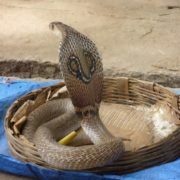 Unique snake’s ability to rejuvenate the skin by dropping the old can be perceived as a symbol of the renewal of life or immortality. 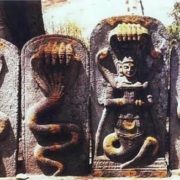 As a female character cobra is the patroness of fertility and motherhood.